Eugene “Gene” Jacobs, age 96, of Hays, KS, passed away on Saturday, June 9, 2018 at Good Samaritan Society-Hays. A Funeral Mass will be at 10:30 AM on Wednesday, June 13, 2018 at Holy Cross Catholic Church in Pfeifer, KS. Burial will follow at Holy Cross Cemetery. Visitation will be held on Tuesday, June 12, from 4-8:00 PM and Wednesday from 9-10:00 AM at the Brock’s-Keithley Funeral Chapel & Crematory, 2509 Vine St., Hays, KS 67601. A Schoenchen Knights of Columbus Council #4166 will be held at 6:30 PM followed by a parish vigil service at 7:00 PM both at the funeral home. 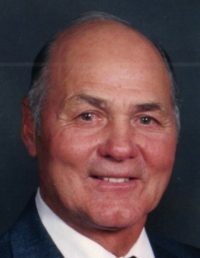 Memorial contributions can be made in Gene’s loving memory to Holy Cross Charities and/or St. Joseph’s Catholic Church, Hays. To share a memory or to leave condolences, please visit www.keithleyfuneralchapels.com or via email to keithleyfuneralhomes@gmail.com. Arrangements are by Brock’s-Keithley Funeral Chapel & Crematory, 2509 Vine St., Hays, KS 67601.